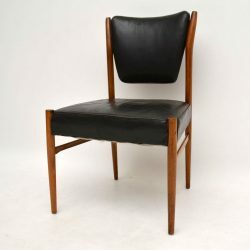 A very stylish and top quality leather chair, this was originally purchased from Heal’s in the 1950’s. It’s in excellent condition for it’s age; the black leather is nicely worn, with no rips or tears, the frame is strong and sound, with some minor superficial wear. The upper back has three screws on each side, on one side the plugs covering the screws are missing. 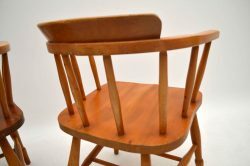 This would be a perfect desk chair as it’s very comfortable, sturdy, and looks great from the back. 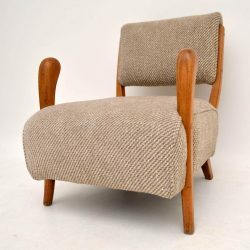 A very stylish and ultra rare armchair, this was designed by Jacques Groag and was made by Steadfast furniture in England, it dates from the 1940-50's. It's in excellent original condition, with the original upholstery. The fabric under the base has been replaced at some point, and there is some slight movement and superficial wear to the frame. The fabric is a little worn, but is very well kept and free from stains and damage. 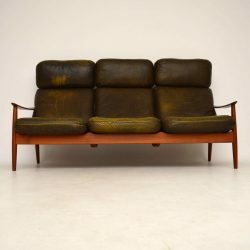 A very stylish, extremely comfortable and top quality Danish sofa, this was made in the 1960's by France & Son. 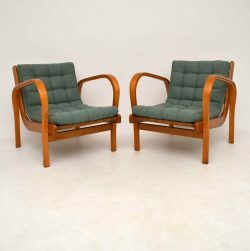 It was designed by Arne Vodder, this has a solid Teak frame and rarely seen original green leather cushions. The leather is in excellent condition, with only some minor surface wear. There is some extremely minor damage to the piping on one edge of the cushion, I only noticed this when taking the photos, we can have this repaired. It's beautifully worn, the green has lightened in places to give a lovely patina that can only be achieved over time. The Teak frame has an amazing shape and is also in excellent condition, with only some extremely minor wear. 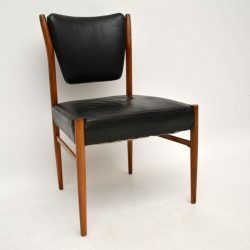 A stunning original leather and Rosewood armchair by Hans Olsen, this was made in Denmark and dates from the 1950-60's. 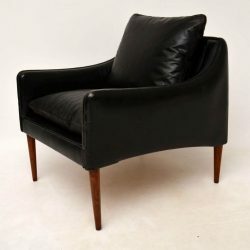 The black leather is in beautiful original condition, though it is quite worn and a little thin in places, with one or two tiny perforations on the sides of the arms. The cushions have been re-stuffed with feathers, and the fabric under the seat has been replaced. 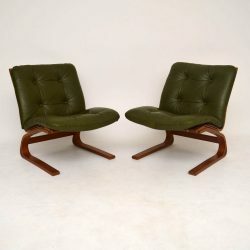 A stunning pair of armchairs, these were designed by Tatra Nabytok and were made in Czechoslovakia during the 1950's. The frames are clean, sturdy and sound, with only some minor wear here and there. 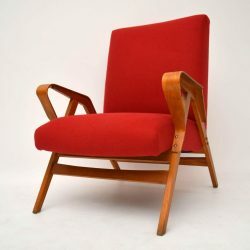 We have had these newly re-upholstered in a beautiful red wool, and they're extremely comfortable. 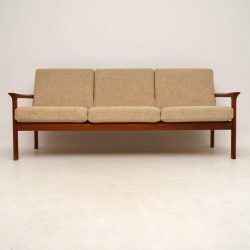 A stylish, versatile and extremely comfortable lounge suite, this was made in Norway during the 1970’s. 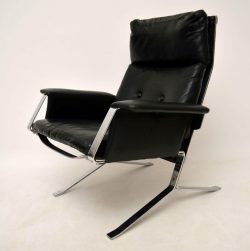 It was designed by Elsa & Nordahl Solheim, was made by Rybo Rykken, this design is called the ‘Kingu’. 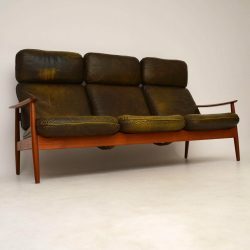 It’s in green leather upholstery, with a bentwood Rosewood frame. The condition is excellent throughout, the leather has a lovely feel, with no rips or tears. The canvass supports have some wear, on the back of the sofa this has worn right through in two small patches, seen in the images. 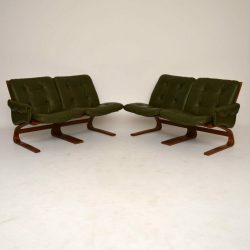 These can be dismantled and re-assembled in different configurations, for example as seen in the images it can be a two seat sofa and pair of chairs, as a corner suite or as a large four seat sofa. 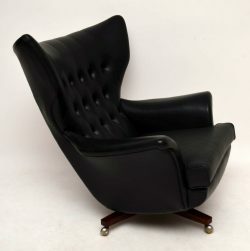 A stylish and iconic retro swivel chair, made by G- plan and dating from around the 1960-70’s. 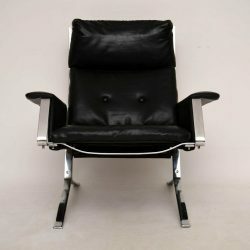 This was originally marketed as ‘the most comfortable chair in the world’ , and you can see why when you sit in it; it is so, so comfortable! The condition is excellent for its age, it’s very clean with good padding, there is only some minor wear on the back left panel, seen in the images. This sits and swivels on a beautiful Rosewood base, and rocks back on springs. 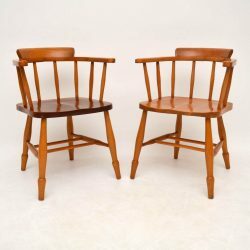 A stylish and top quality pair of captain’s chairs in solid Elm, these date from the 1950-60’s. They are in very good condition for their age; they’re both clean, sturdy and sound, with some light surface wear here and there. One of the seats is darker than the other for some reason. 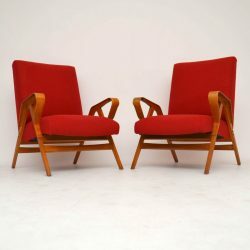 A stunning pair of armchairs, these were made in Sweden during the 1950's. 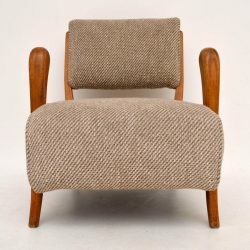 We have had them fully stripped and re-polished, we've also had the cushions newly upholstered in a beautiful wool fabric; the condition is amazing throughout. The seat webbing is original, it looks a little worn but it is tight and strong. 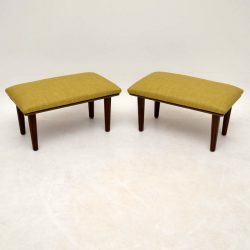 A cute and useful pair of stools, these were made in the 1960’s by Le Grest and co. Not sure if that’s meant to be a pun! 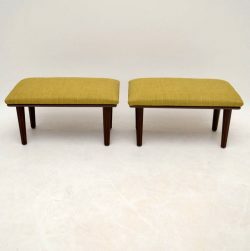 They each have a tilt mechanism, the frames are beautifully made from Walnut, and we’ve had these re-upholstered in our light green fabric. The condition is superb for their age. 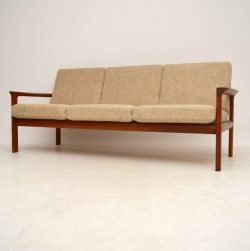 A top quality and very comfortable Danish sofa in solid Teak, with light wool upholstery. This was made by Komfort, it dates from around the 1970's, and the condition is superb for its age, with hardly any wear to be seen. 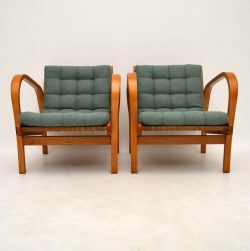 We also have the matching pair of armchairs, stool and coffee table available separately under our other items for sale. 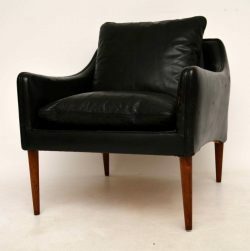 A very rare and beautiful armchair, this very much looks like a design by Olivier Mourgue originally made in France. This is a registered design, it's called the Geneva, and has an original label present. It was made a company with the initials VM, I don't think it's Vatne Mobler, the label appears to be written in Dutch. 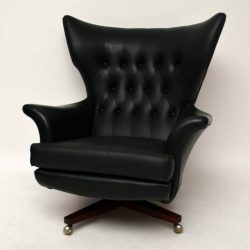 This is quite confusing, but nevertheless this is an amazing looking armchair and the quality is superb. The condition is excellent for its age, with only some minor wear here and there. The upholstery is black vinyl which looks extremely leather like. We've re-upholstered the armrests and re-strapped the seat base.